Who doesn’t crave a hearty tortilla soup from time to time? 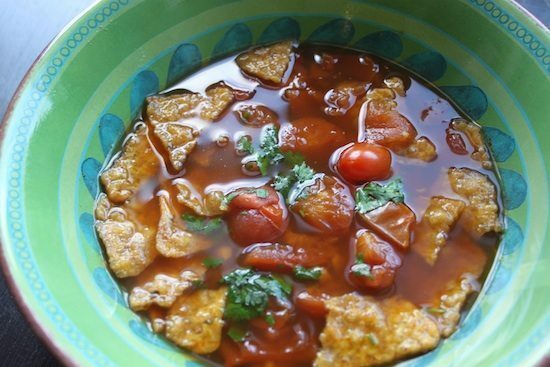 This 20 Minute Tortilla Soup is easy and will soothe all of your crazy cravings. All it is is a couple of veggies, some vegetable stock, plenty of spices and voila! Tortilla soup! Many commercial soups are loaded with either too much fat or too much sodium. When we have too much fat and sodium in our diets, it can lead to excess weight gain and chronic diseases, especially heart disease. Heart disease consists of heart attacks, clogged arteries, strokes, congestive heart failure, and a number of other complications. Heart disease is known as a silent killer and is one of the number one causes of death in America today. Make sure to buy your vegetable stock with no sodium added. So making your own soups can be one small way that you can save yourself from some of those added fats and salt! Start off by heating your vegetable stock over medium-high heat. Add in your chopped tomatoes and let simmer. Then add your spices and garlic. Then your lemon juice and olive oil. Bring it all to a boil. Then reduce the heat and let simmer for about fifteen minutes. When it is time to serve, crunch up eight tortilla chips and add them to the bottom of the bowl. Add a pinch of salt to taste and garnish with cilantro. We love to add some slices of avocado or tossing some corn into the mix. Pair with a side of rice or quinoa for a fully balanced dish. The best part about this soup is that it only takes twenty minutes to make as opposed to some other homemade soup recipes. What do you think about making your own soup? Let us know what you think in the comments below! My roommate and I made this soup for a brunch gathering today (along with the cilantro sweet potato salad) and everyone was all about it. We added black beans, which was a wonderful addition. Someone even said, I definitely want to come over if y’all are cooking like that, lol. Thank you so much for all the information on your website and the awesome recipes! Aw that’s so good to hear!! I love that soup because it is ridiculously easy but it tastes great. Thank YOU for checking out our site and trying our recipes!